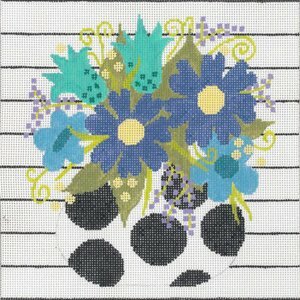 This contemporary floral design, Petite Pot Blue is handpainted onto 14 mesh needlepoint canvas and depicts flowers in bright blues & greens. The design area measures 9" x 9" and is handpainted on 14 mesh mono canvas. You can purchase this design as canvas only or with threads. If you select cotton threads we will send DMC embroidery floss; if you select silk threads we will send Planet Earth Pepper Pot boutique fibers which are single stranded or mixed threads, we will send mostly silk with some Glisten by Rainbow Gallery for some sparkle. We recommend two pair of 13" stretcher bars. This Machelle Somerville contemporary handpainted needlepoint design would be suitable for a beginner- intermediate stitcher.